And that, mate, is where Hunter Valley holidays come in. Grab your BFFs and escape to the slower side of life near the central coast of New South Wales. Visit small towns and villages—like Broke, Mount View, Rothbury and Singleton—where your favourite libations are born, from Chardonnay to Shiraz. Taste the local history, easygoing rural culture and, of course, the growing foodie scene that complements the region’s crème of the crop. 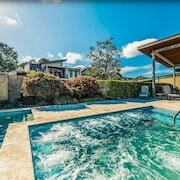 Sure, those will get better with age, but Wotif’s cheap Hunter Valley packages are in their prime right now, so let’s travel! First things first, driving is the best way to get around, so pick up one of Wotif’s Hunter Valley car hire options and draw straws with your travel buddies—short straw is the designated driver and the long straws can start sipping! 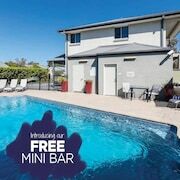 Kick off your Hunter Valley holiday in the village of Muswellbrook on the west side of the valley and work your way to the coast. Muswellbrook is known for its lush pastureland, charming Heritage Walk and cheese—so pick up a little somethin’ somethin’ to pair with your favourite merlot and keep cruising. Next up, stop in Singleton, home to Singleton Historical Society & Museum Inc. and the Australian Army Infantry Museum. Next, drive south to Broke. Don’t worry about the name—there’s nothing that needs fixing about the village’s sprawling vineyards and hiking trails through Pokolbin State Forest. Stop and golf a few holes in Rothbury—since you’re already feeling swanky like that—before catching a rodeo in Cessnock and sunbathing on the coast of Newcastle. Gotta reward yourself for all that holiday-making. 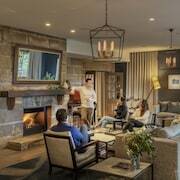 Wine isn’t the only thing you’ll be piling in the boot as you give your hot Hunter Valley package a run for its money. The grape-friendly climate is also perfect for growing olives and inspiring artists with natural beauty. Many vineyard tasting rooms showcase other tasty treats, art for your flat and jewellery, too, so load up on fresh olive oil and local treasures. While there are plenty farms and dairies throughout the Hunter Valley, restaurants are limited in the individual villages. But what they lack in numbers they make up for in gourmet farm-to-table flavour. Many of these independent bistros feature French-inspired fusion cuisine, so bon appétit! In this area day and nightlife tend to blur together, thanks to all the classy day drinking. For the late-night bar experience, check out Rutherford or the nearby town of Maitland. Otherwise, tuck into a nice cafe and let the wine and good conversation flow. 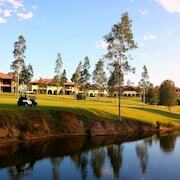 Mix and match flights and accommodation for awesome deals on Hunter Valley packages with Wotif. Then, pack your appetite and a can-do-nothing attitude and get ready for a peaceful getaway in wine country. Spend a relaxing morning or afternoon walking and playing, or have a leisurely lunch, in these family-friendly gardens. 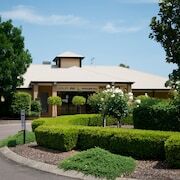 Enjoy a sensory and educational experience at one of the most respected winemakers in the Hunter Valley. Spoil your taste buds with exclusive wines, made with the sole purpose of accompanying food, in this boutique winery in the Hunter Valley. Sample local food and wines at this picturesque winery with cellar door tasting sessions and an open-air restaurant. Taste wine straight from wooden barrels at this former hobby winery, which is now one of Australia’s most notable wine producers. Over 150 years of heritage, and the story of a boy named Audrey, makes this winery a fascinating historical attraction. Contemporary art and boutique wine join forces at this family-run winery. Spend the day roaming this leafy bushland zoo to hand feed kangaroos, spy Tasmanian devils and see a huge range of reptiles from Australia and beyond. Close to everything that we need to do. The staff were excellent. We also enjoyed our dinner downstairs on Friday night. The wait staff were very polite and effecient. Plenty of open spaces. Beautiful surroundings and excellent swimming pool. The facilities, the cleanliness, the friendliness, the view, the serenity and the property in general is a-mazing! I like the location, golf field and hotel facilities. We loved everything about Spicers Guesthouse, great service, everyone smiles and nothing is too hard for them to handle. The space is beautiful, relaxing and approachable but sophisticated. We loved Spicers Guesthouse. Bravo! Lovely clean motel. 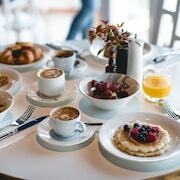 Easy to find and close to places for breakfast... quick easy access to highways etc. Plenty of morning fresh air with beautiful kangaroos jumping around nice scenery. THe rooms were very comfortable , staff welcoming. 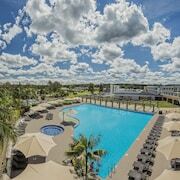 Clean, good facilities, near main attractions and beautiful.